Today marks the 22nd year of Ukraine’s Independence from the Soviet Union. If you are in Ukraine, the celebrations have already started and many more are planned throughout the next few days. Stephen Harper issued a statement today, as well as the White House. Viktor Yanukovych called for Ukrainian unity. 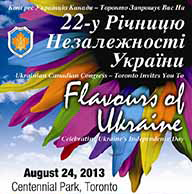 Celebrating Ukraine’s Independence Day with Kozak games, dance shows and live bands. Special performance with Marta Shpak from Ukraine, Zabava with "Hudi i Motsni" and "Zapovid" and Special guest performance "Nadia". The parade starts at 11 a.m. at Grantwood Drive and will proceed up State Road to St. Josaphat Ukrainian Catholic Church Cathedral, located in the heart of the city’sUkrainian Village. The 55 organizations scheduled to march is the most in the parade’s three-year history, with Ukrainian-American military veterans leading the way as grand marshals. 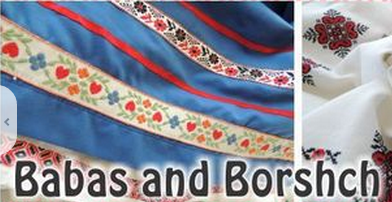 "This event is designed to not only reach out to our Ukrainian-American community, but also to those with an interest in the region," according to organizers. The Ukraine Independence Day Celebration will be held next Saturday, August 24th at noon at Crestway Baptist Church, which is located at 6400 Crestway Boulevard in Birmingham. The free event itself is set for Saturday, Aug. 24, at Dinsdale Park. The celebrations start at 4 p.m. with a concert of both traditional and contemporary music. The concert will be performed by UCA "Tryzub" members, who were able to practice for the event at the Ukrainian Reading Association Hall thanks to the Ukrainian Reading Association and the Catholic Ukranian-Canadian Men’s Club. Following the concert, family and children activities will be offered from 5 to 7 p.m., including mini-soccer, a clown and face painting. There will also be food available for purchase, including smokies, muffins, cookies, cotton candy, ice cream and non-alcoholic beverages. Those who wish to can also donate to a children’s charity that will be chosen for the event by UCA "Tryzub." This FREE Festival will honour and celebrate the very best of the Ukrainian culture–food, history, religion, arts and culture—through a fun, hip approach. Not Ukrainian? No problem. We’ll make it happen when you show up at the Passport Office to "assume" your Ukrainian name and identity. Join us at the Club for a BBQ to celebrate Ukrainian Independence Day.